Courthouse Hill Arlington condominium in 2 sentences: Courthouse Hill is a smaller, five-story community that features mostly one and two bedroom layouts to go along with the rare two-story condo floor plan that can be found on the fourth floor. The community is centrally-located in the Courthouse neighborhood and while the amenity package is not overly-impressive, the community does feature a fantastic outdoor pool. Amidst the high rise condos that dominate the Clarendon – Courthouse landscape, there lies the five-story community of Courthouse Hill. Consisting of just 133 residences split up into four separate buildings, Courthouse Hill offers a variety of layouts and floor plans to go along with a handful of amenities that the condominium community shares with the Courthouse Hill townhouse community. Built in 1996, Courthouse Hill represents a change-of-pace community and almost embodies a suburban-style condominium community. The condo is made up of four separate buildings, each of which contain around 35 residences. Since each building is independent from one another, the community will have a much smaller feel than its high-rise neighbors like The Charleston or The Williamsburg. Seeing as the community is on the smaller side, the amount of amenities will reflect said size. Courthouse Hill features a clubhouse with a meeting room and a small cardio room; the clubhouse also leads out to a nicely-sized outdoor pool. The pool is a surprisingly-nice amenity. 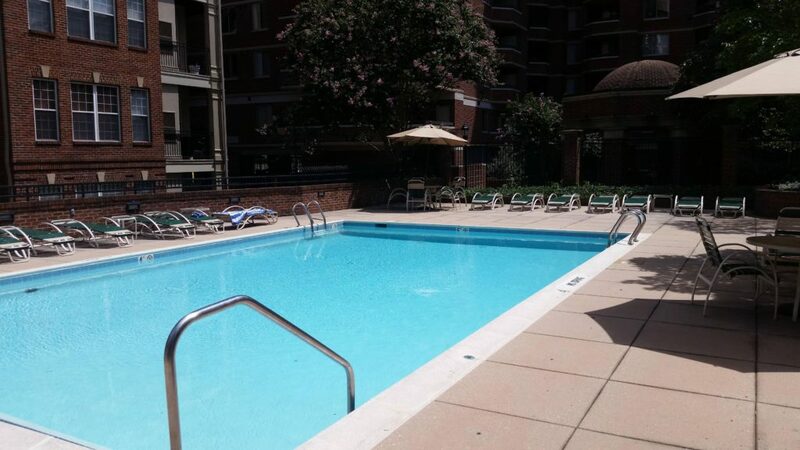 For a condominium community of this stature, it is a great asset to have and the condo fees do not appear to be severely-impacted by the inclusion of an outdoor pool. Floor plans will consist of one, two, and three-bedroom layouts. Most Courthouse Hill floor plans will be of the one and two-bedroom variety. These layouts will most likely feature one bathroom, although some larger two-bedroom layouts do end up coming with a second bathroom. Common features include a balcony, fireplace, as well as a smaller kitchen. Gas cooking is found throughout the community, which is a boon for the complex. Carpet can be found in units that have not yet been thoroughly renovated while hardwood floors are becoming more prevalent. Although in terms of square feet Courthouse Hill can be on the smaller side, layouts are optimized to make the most of the layout. Many floor plans will have a breakfast bar, or even a dining room section of the layout that is separated from the living space. The most coveted floor plans at Courthouse Hill will be the two-story, three-bedroom layouts. Every residence on the fourth floor at Courthouse Hill is two stories. Some will be two bedrooms while the larger floor plans will be three bedrooms. Topping out at 1,400 square feet, these three bedroom layouts will almost mimic a smaller townhouse floor plan, yet at a fraction of the cost. 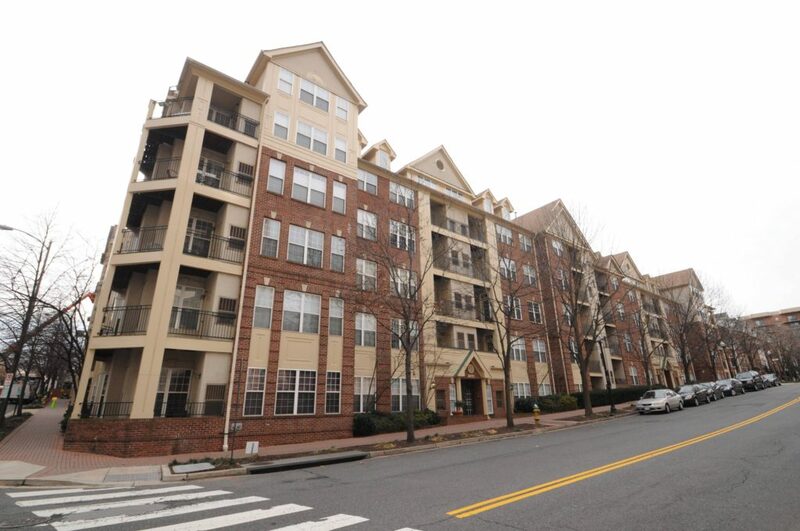 Two-story condos in Arlington are tough to find and the units at Courthouse Hill do not disappoint. Courthouse Hill condos offers a respite from the numerous high-rise condo communities in the Courthouse neighborhood. Although the community is wood construction, efforts are being made to diminish noise between floors. Newly-renovated units have to have a cork layer and cement leveler in the sub-flooring when installing new hardwood floors. Wood construction aside, the community offers solid layouts in a great location. With the Envision Courthouse Square plan being implemented just one and a half blocks away, the neighborhood will see drastic improvements in the future. Courthouse Hill is great for those looking for a quieter community in a great location with the added bonus of a few nice amenities.